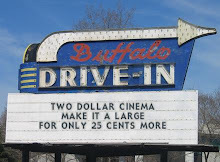 Two Dollar Cinema: This will be my final evaluation. As intriguing as this setup may be, the idea that Dr. Staple is actually offering these three wackos help, from the jump there's an overwhelming sense that something decidedly more sinister is in play. And when her true intentions are revealed, well, that's where the line is drawn for how you'll ultimately feel about Glass. Unless Betty Buckley's got a tattoo that I didn't see, then this ending kinda comes out of nowhere, you know? [but if I go back and she does have that tattoo then these are my favorite films of all f--king time, hands down]. Security footage of David Dun at the IKEA in Conshohocken. Assuming you've seen the other two films and you're sitting down for the third, it's safe to say that you're a fan of this story, these characters (and the actors that portray them). 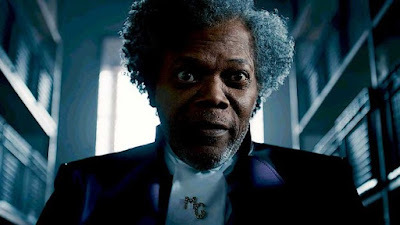 In that sense, Glass is an overwhelming success (I could watch McAvoy play this character forever). 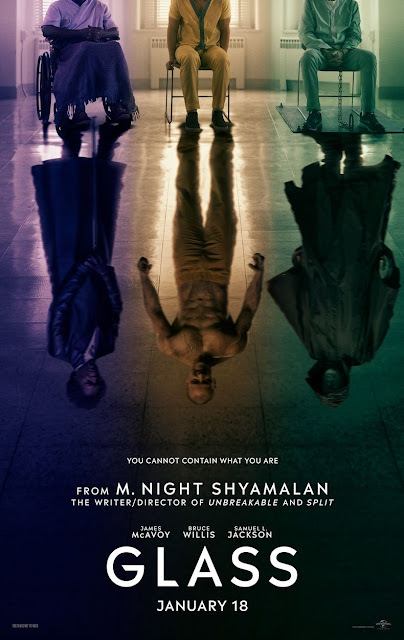 But as the capper to what some could consider an epic trilogy, the ending, like in almost all Shyamalan films, is going to be nothing short of divisive. Also splitting the audience in half, are the Yays and Boos. On the one side, you have the people that absolutely hate every word they've ever read concerning those two a-holes. And on the other? The illiterate and those without decent WiFi. but I'm not sure it's another personality. Even if it occasionally veers into parlor trick territory, I'm all for McAvoy just letting it fly with all the personalities. Speaking of, the only thing better than Hedwig, is, you guessed it, Hedwig on rollerskates. While there's not a ton of action, what we get is pretty stellar. Dunn's table save was an insanely clutch move! And while we're here, good luck on that squeeze move. Pretty sure Dunn ain't bothered in the least. Fingers crossed the next film is called Casey. And it stars just Anya Taylor-Joy. And runs just over four and a half hours long. Wow. It's pretty cool to see Spencer Treat Clark all grown up. Bonus points for the fact that he looks a less a-hole version of Randall from Clerks. My God, when Hedwig meets Glass? Is there anything better? While they used a lot of it in the trailer, the epic battle out front of the psychiatric facility was pretty cool. The Horde f--king chucking guys was impressive, as was that shot of him lifting up the cop car. And finally, the ending. It may not have been the twist I was hoping for, but to put it mildly, I didn't see THAT coming. Hopefully, a future film (or two) will make this ending, uh...worth it. ...this is exactly the look I'd be going for. Man, those 'Superman punch' guys were real dicks. Dude, why are the cops sweating David Dunn? I've spent enough time in Philly to know that they could use some vigilante justice. A lot, actually. Casey's an odd bird to say the least. I'm not sure how I feel about her, um, feelings, but it's safe to say that I'm totally f--king jealous. There was a pretty long stretch of Glass that, uh, didn't feature Glass. I am here to discuss the possibility that you are mistaken is the nicest way ever of telling a group of people that they're f--king psychos. Yo, I've always hated vomit-inducing rides like the Dark Cyclone. And that was before they were basically the impetus for world-ending villainy. Like, way before. Guys, this psychiatric facility, like almost all featured in movies, is just the worst. Staff full of murderous a-holes? Check. Complete lack of awareness of the previous evening's misdeeds? 10-4. Impossibly slow response by the authorities? You betcha. It's the whole trifecta, honestly. Speaking of, no one questions the lady from Paddington? Are you kidding me? I'd like to think that I uh, misremembered something, but I checked around and I didn't. That's what's gonna kill ________? A f--king ____________? And finally, that ending. Like I've already said, if we get something else, if we get another (really good) film, than it's all worth it. But if that's how this whole story ends, like for real for real, well, we're gonna have a problem. ...is also going to be a long night. Ha! Your opening to this review is perfect, I love it. I have to admit, the twist caught me off guard, but it was SO disappointing. I don't know what I expected...but it wasn't that. To be honest with those tattoos I was hoping the whole thing was actually just tying itself in with the Cloverfield franchise! YEessssss! Thank you so much. I think the twist caught EVERYONE off guard, because it doesn't make all that much sense....yet???? That is the nicest thing that anyone has ever said on this site. Ever. LOL, this gave me a laugh! I liked this one. It's the lesser of the trilogy, which is not saying anything truly negative when both Unbreakable and Split are semi-masterpieces in their own genres (I mean, Unbreakable is one of the single greatest superhero films ever made and Split is nearly a pitch perfect horror film), but I really liked it overall. McAvoy is just on fire. I'm still sore that he didn't get any awards traction at all for Split, since his performance was a revelation. And Hedwig, yes...but Hedwig on roller-skates...YASSSSSSSS! It probably is the lesser of the trilogy, but I had enough fun with it that I'm okay with that (but, damn, imagine if this had been the best one?). And I totally agree about McAvoy...maybe it's too gimmicky or something, but it's sooooo good, you know? YES! Hedwig needs his own prequel trilogy. Loved this review! I agree that the table save was a great moment. I wanted more of that kind of stuff here. Thanks, AW. I can't say I didn't enjoy it, and I assume I'll like it even more the second time, but yeah, man. Seemed a bit too restrained, even if that's kind of a hallmark of M. Night flicks.